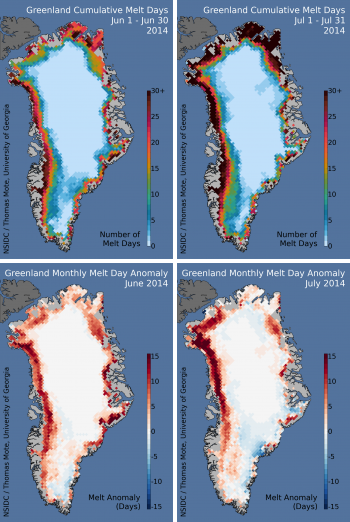 Melting on the surface of the Greenland Ice Sheet in June and July 2014 has been well above the 1981 to 2010 average in most areas, but after a fast start in May, the southern region and the southeastern coast have seen lower-than-average melt. Mid-summer surface melting did not reach higher elevations (above 2000 meters) as often as in the reference period 1981 to 2010. Short bursts of extensive melting were related to periods of high air pressure over the ice sheet favoring sunny conditions, and promoting increased melting in darker areas of the ice sheet (wet snow, bare ice, or dirty snow). Daily melt extent in June surged to nearly 40% of the ice surface area by mid-month and remained above the average extent for the 30-year reference period (1981 to 2010) for almost the entire month. Positive melt day anomalies were present in all areas except for the southeastern ice sheet. In July, melting was intense along the northwestern coast (more than 15 days above the average in some areas) and unusually low along the southeastern coast, especially near Helheim Glacier where July melt days were 3 to 8 days less than average. Overall, melting was less frequent than average in the high interior and southeastern areas of the ice sheet. Figure 2. Melt extent time-series for 2014 (top) and average air temperature anomaly at a level about 800 meters (2,500 feet, 925 hPa) above the sea level for June 1 to August 14, 2014. 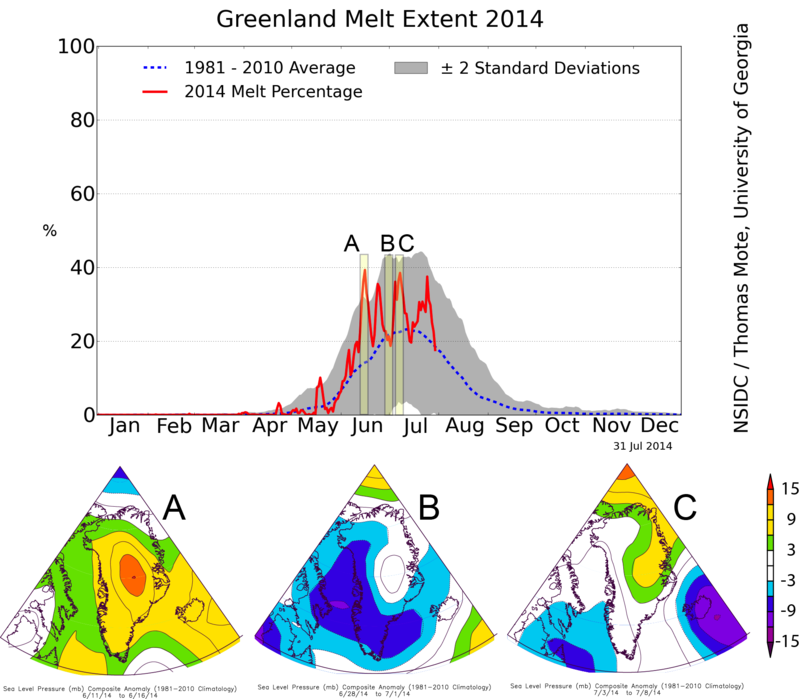 Melt extent data are from the Greenland Daily Surface Melt 25km EASE-Grid 2.0 Climate Data Record. Air temperature data are from the National Center for Environmental Prediction (NCEP) Reanalysis. Thus far, the maximum daily melt extent for summer 2014 was near 40% of the ice sheet surface on June 13. This was the first in a series of four warm periods followed by four periods of near-average conditions spanning the rest of June and July. Since August began, daily melt extent declined to near-average values for late summer. Summer air temperatures for June, July, and the first half of August mirrored the overall pattern of melt intensity, with cooler-than-average conditions about 1degree Celsius (1.8 degrees Fahrenheit) below normal in the high ice sheet plateau, and warmer-than-average conditions along the western coast, especially the southwestern coastal area at 1.5 degrees Celsius (2.7 degrees Fahrenheit) above average. 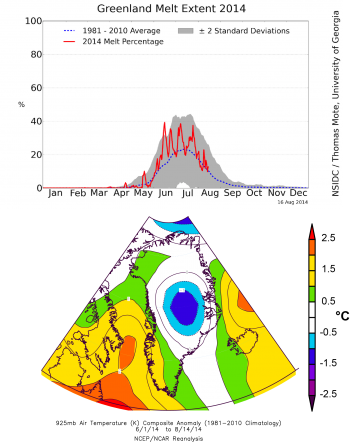 Models of the Greenland 2014 summer season produced by the MAR version 3.4 model of Xavier Fettweis from Liège University show that the overall snowfall-melt balance for Greenland (the surface mass balance, or SMB) is very close to the 1981 to 2010 average. While 2013 total autumn snowfall was slightly higher than average, melting in the 2014 summer has now reduced the initial winter 2013 to 2014 snow accumulation surplus. 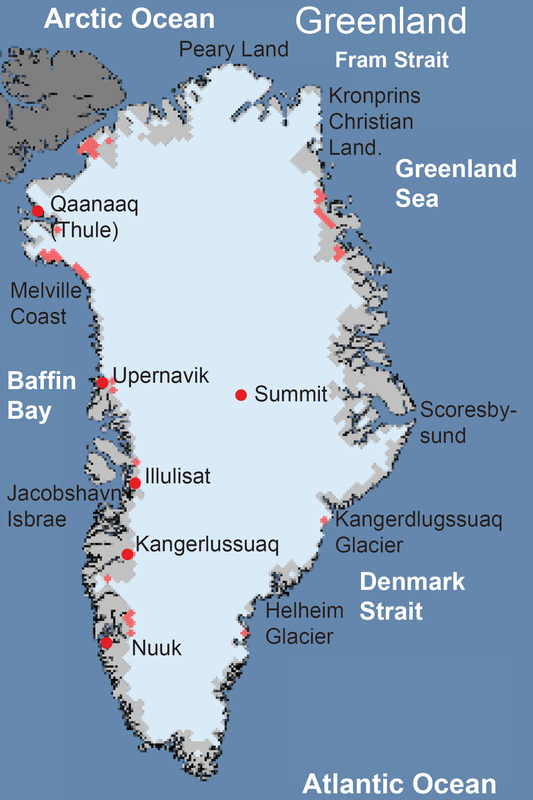 However, despite the high total snow amount, northwestern Greenland had lower-than-normal winter snowfall accumulation. With the onset of a vigorous melt season in that area, the bright white snow cover was quickly removed, exposing darker ice below, and increasing the amount of melting as well as decreasing the ice sheet meltwater retention capacity in this area. This has produced a strong and statistically significant negative mass balance for this summer along Greenland’s northwestern coast. Figure 3. Three six-day periods in the Greenland surface melt extent daily time-series plot outline periods of high and low melting during June and July. Below, surface air pressure anomaly plots for the same periods (A, B, and C) are shown. A and C are high-melt-extent periods, and show greater-than-average air pressure (2 to 6 millibars); the opposite is true for the low-melt period, B. The two other high-melt periods, June 15 to 20 and July 19 to 25, also show higher-than-average air pressure. Melt extent data are from the Greenland Daily Surface Melt 25km EASE-Grid 2.0 Climate Data Record. Air pressure data are from the National Center for Environmental Prediction (NCEP) Reanalysis. The four higher-melting periods of mid-June to late July and the intervening periods of more average melt extent appear to be associated with periods of high and low air pressure, respectively. Examining six-day intervals in air pressure reveals higher-than-average pressure dominates during the peaks in surface melt extent, and low pressure during the low-melt periods. High pressure is associated with clear skies, and therefore greater solar energy input to the surface snow, impacting mainly the low albedo zones (in particular the ablation zone). This explains why the melt extent has been abnormally high in the ablation zone and abnormally low in the higher-elevation snow accumulation zone. The melt rate in the accumulation zone is more sensitive to warm but cloudy days and the associated increase in long-wave radiation, due the high surface albedo in this zone. Moderate Resolution Imaging Spectroradiometer (MODIS) images of Greenland on June 13 and July 3 indeed show a mostly cloudless Greenland, whereas more cloud cover is present on June 30 and July 1 during the lower-melt-extent periods. Figure 4. 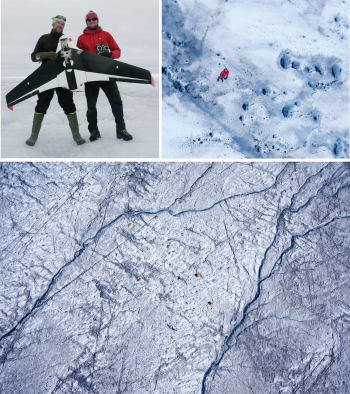 Images of the Greenland Ice Sheet near Kangerlugssuaq in west-central Greenland taken by a drone (UAV) used to evaluate the evolving albedo of the ice sheet surface during the summer melt season. At top left, Prof. Jason Box and Johnny Ryan, a Ph.D. student at Aberystwyth University, hold the drone they used. Top left, the drone takes a picture of the surface (and the operator, J. Ryan) on August 9, 2014 from low altitude, showing numerous cryoconite holes filled with black dust, grit, and soot that had accumulated in the winter snowpack, and melted out of the older ice below. Bottom, a higher-altitude image of the same area reveals sinuous melt streams and linear fractures, as well as small speckles of cryoconite holes on the ice sheet. Tents from the camp are also visible as colorful dots against the ice surface. Credit: Photos courtesy of Johnny Ryan, Aberystwyth University, Jason Box, GEUS, and Dark Snow Project. Fettweis, X., et al. 2014 Greenland ice sheet SMB simulated by MARv3.4 in real time. Ryan, J.C., A.L. Hubbard, J. Todd, J.R. Carr, J.E. Box, P. Christoffersen, T.O. Holt, and N. Snooke, 2014, in review. Repeat UAV photogrammetry to assess calving front dynamics at a large outlet glacier draining the Greenland Ice Sheet. The Cryosphere Discussions 8, 2243-2275, doi:10.5194/tcd-8-2243-2014.